Some interesting design ideas here. 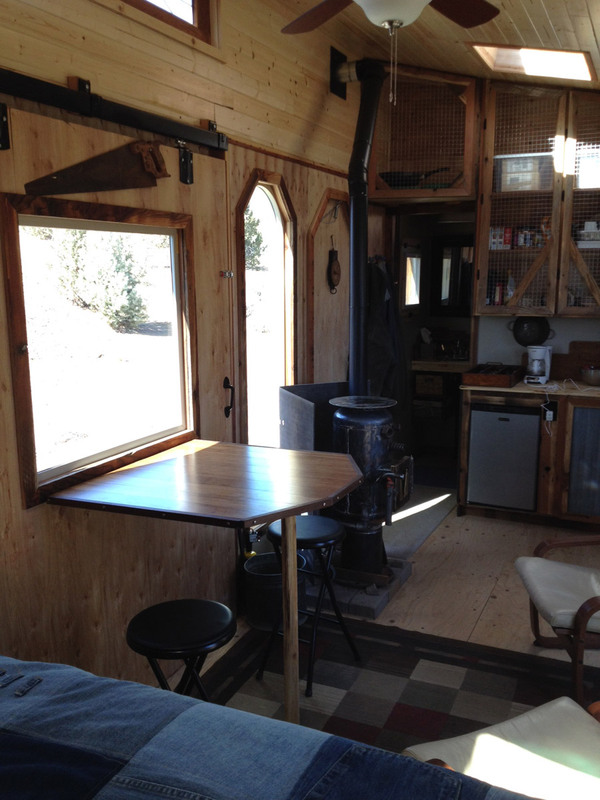 I like that wood stove and the big sliding door. 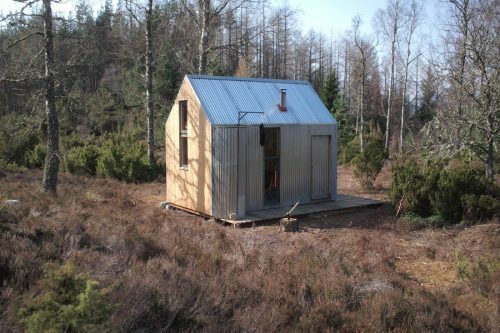 Looking at tiny house idea’s and finally one without a loft. My mother want’s one for at my house …she is almost 80. I love yours. Some really nice ideas there. I like the use of the wire screen for the cupboard doors, saving weight. Also like the exposed copper pipes, almost like a design statement, art. I love this place. How much is a home like this worth? It really suits me. Designer Digs ! This place is fabulous! Really well thought out and very stylish. Thee appears to be plenty of storage space and that kitchen can clearly be used to prepare real meals. I’m assuming Kevin cooks in/on the stove ? I love it all, but I think my favorite feature is the heated towel rail … just brilliant ! There are a ton of things I like here! The design of the exterior (I would like to see the other side) which keeps things interesting. The very usable kitchen with a definite style in keeping with the rest of the house. The door into the bathroom~been thinking of doing something similar and it is good to see it in practice. The variety of woods and textures inside. What are the size of the cabinet? I meant ‘there’ not ‘thee’ .. of course. Love the front door and the large window next to it. 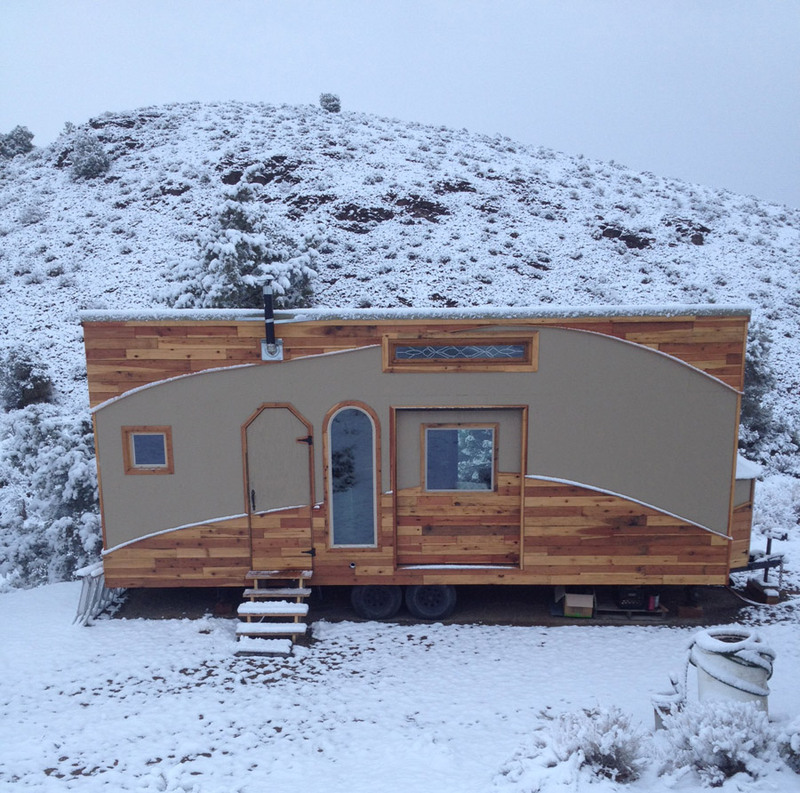 Tiny homes NEED curvy lines. Usually too many sharp angles. Kitchen is nice tho I think the wood stove takes up a bit too much space and crowds the kitchen which could use a small regular stove and bigger fridge. Love the two(comfortable looking) matching chairs and extra stools around the table/desk. Indicates room for company. The bed. Good job! space on either side as well as storage. Blue cover looks great with all the wood. Bathroom. Nice. Looks like shower is a normal size. Plenty of storage. 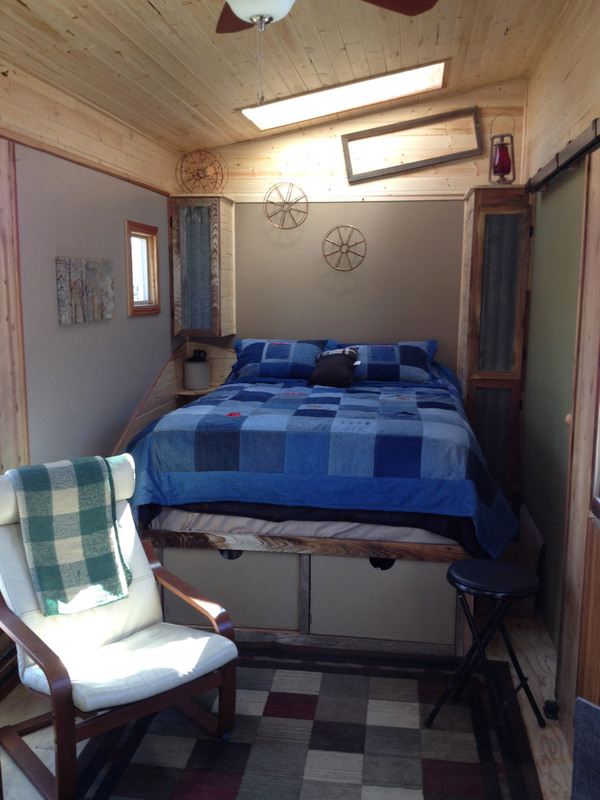 All in all looks very functional and cozy for one person who likes company now and again. Where are the clothes being stored? Is this an 8 x 20? 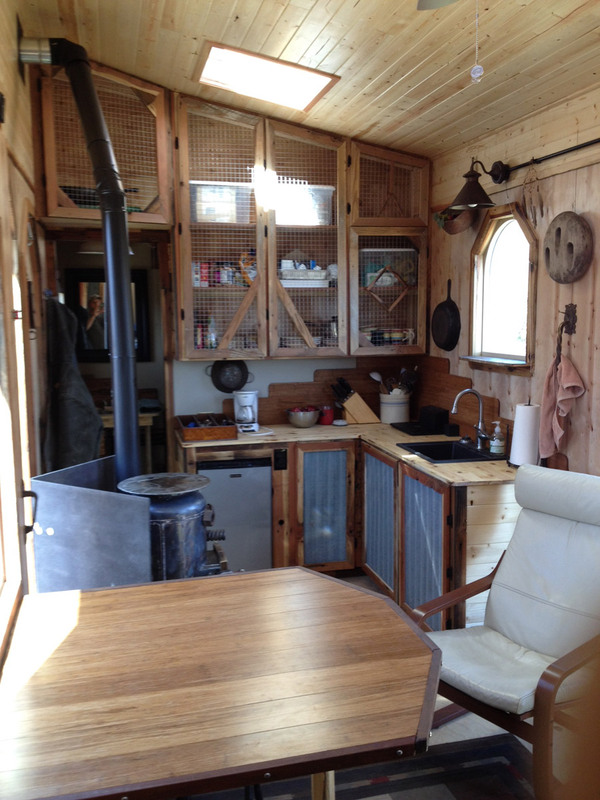 So much I love about this; the unique stove (made out of a propane tank I presume), the barn door instead of a regular one, the wire mess as well as the corrugated metal on the cabinets, a bed instead of a loft bed, the sky light, all the different woods, the slanted roof….WOW! I am presuming there is a composting toilet? 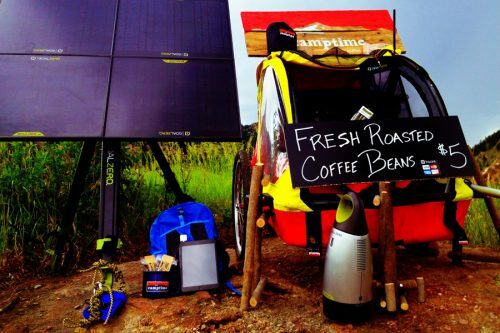 I will be using a lot of these ideas when building my own off grid tiny home on wheels! Thank you Kevin! Nice layout, especially for those of us who are too old to be climbing up to a loft, and the bedroom is really spacious too. The only thing that is missing is a proper range and oven. I do way too much baking and cooking to go without, but for a young single man it would certainly work. 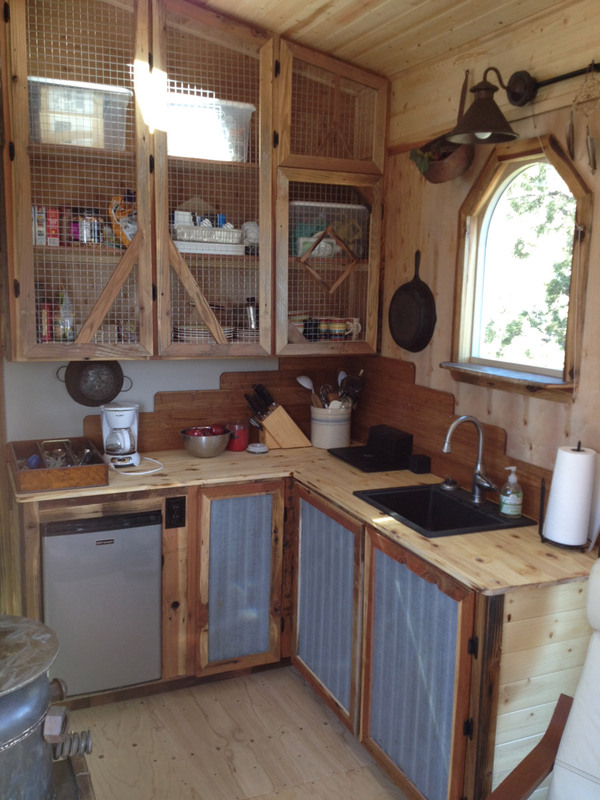 I love Kevins tiny house, It is the first one I have seen that actually sports a usable kitchen!!! Hillbilly Wicked… Could do more without the chrome faucet fixtures like maybe use copper or copper plated. I love love love this tiny house ! I’m disabled and could not crawl in/out of a loft so floor plans like this one really excite me ! I haven’t seen any tiny homes made from shipping containers, or made “like” them, that I really like. But this house, even though it’s more rectangle than I normally like, is wonderfully done. Inside & out ! I love Kevin’s home BTW!! This couldn’t be cuter! It looks so complete! The only thing I didn’t see that I’d like was an roll down awning! It is perfect and cozy. Where was the fridge? I would like to know the dimensions…assume it is 8′ wide but what is the length? I love the uniqueness of the outside design. Loving it~! I really like the creativity with the cabinet screen doors and that wood burning stove!!! Like the sliding barn door to open it up (of course, maybe a screen in the summer. Is there anywhere I could learn the floor plan or dimensions for the house? Maybe more pics? It really seems to be just the right size for what I had in mind. Thanks for your interest! The size is 8′ by 26′, I’ve been trying to figure out a screen. Still have to put on a porch. Thanks again! love the drop down table on the door. great layout. the corrogated metal. Since I have been looking at some many houses with the rustic chic look, I am beginning to take a shine to them. I would still have to add a few feet to squeeze in a proper side closet space, washer/dryer and a office/working space. but its great. Thanks for the comments! The exterior siding is some old redwood fence pickets that were reclaimed and plained, sanded and made into siding. Faaaabulous! So much thought & effort went into this abode it’s very obvious! Great design ideas, very creative use of materials. Making notes so I might incorporate a couple of things into my future plans. I know you are very proud of this project! Great Job Kevin! Thanks for your kind words! Good luck with your project! I love your place! very simple, yet has its own elegance. I love the design when looking at the front door. Really like that sliding door. Awesome! Wonderful tiny house. I like how you made a towel bar out of the copper pipe. The big siding door and windows should make you feel your living outside. Great use of recycled material . 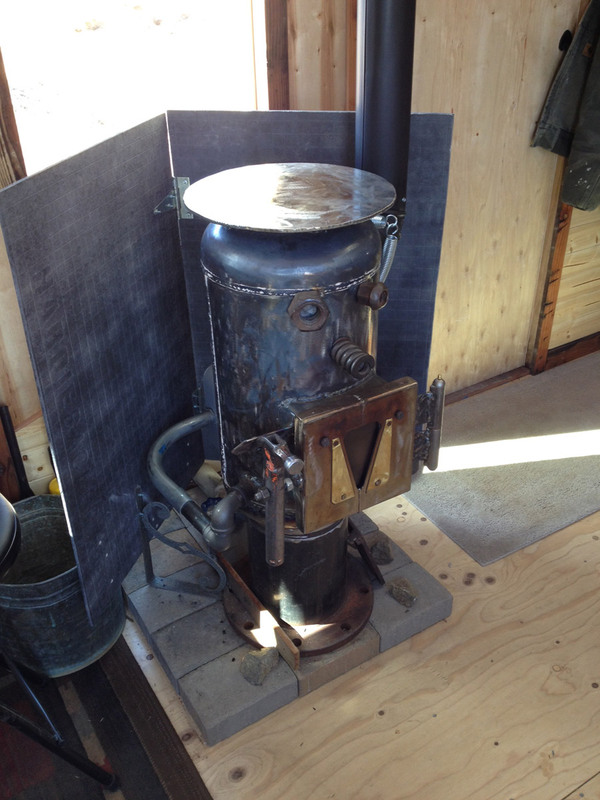 Love the face on the wood stove and the fact theirs no loft. Thanks for sharing ! What a great build. Say how did you insulate the floor? This is one of the greatest tiny houses I have seen yet. How well does it travel or tow behind a truck. Do things remain stable? Also, are you available to contract for tiny house construction? This makes me want to curl up with a long book and a big cup of coffee. I can’t imagine a more peaceful setting. Well done. Kevin, congratulations on making your dream come true. I love your house, and all your design innovations. My own house is very different, but also has a shed roof and the bed on the main floor. I have a small loft over it for my books and storage, and to hang a transfer bar on if I need it to get from bed to wheelchair. I designed mine for a little old lady. That’s why I sign lol so often. lol I’m counting on being in mine for years to come, although I realize that most tiny houses are being built by younger folks. I’m advocating for elders to move tiny. Best wishes for a happy life there as long as you want/need it. Where did you find the screen that you used on the kitchen base cabinets ? 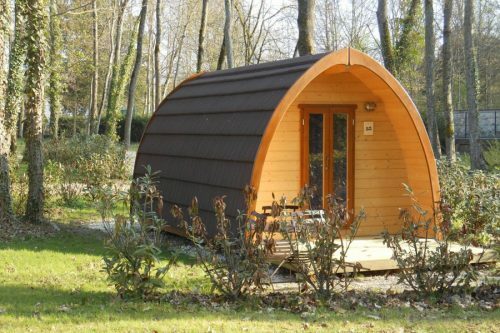 Hi I really like this unit- are plans available?